Ganz, the company that married stuffed animals with social gaming with Webkinz (now on iPad) has recently introduced Tail Towns Friends, a game filled with juicy gossip, farming, drama, forbidden love and collectible figurines... you know, for the ladies. 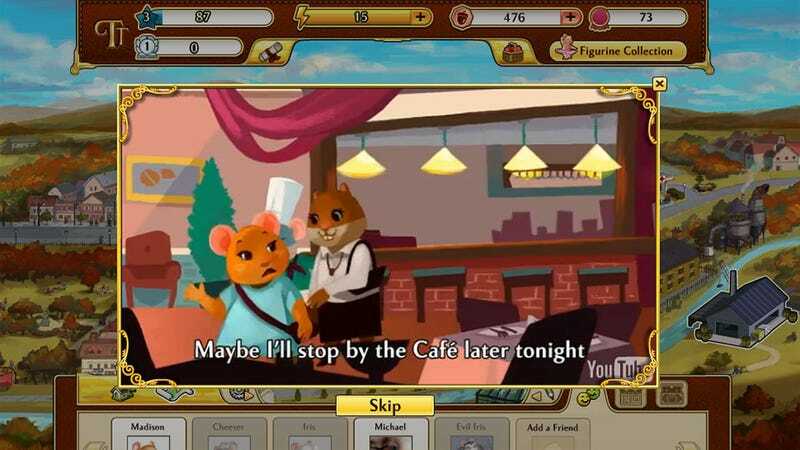 In Tail Towns Friends, players enter a soap opera world populated by tiny anthropomorphic cats and mice. As the player creates their dream country retreat / fruit and vegetable orchard, the animals of the big city live, laugh and love. One of the ways players can be privy to all of this living and loving is by purchasing a series of collectible animal figurines. The first series features a dozen characters, each complete with a code that unlocks their story in the game. The official literature for the game makes it quite clear that this is a game for older women who spend their alone time on Facebook. To me it sounds like a game custom-made for The Onion's Jean Teasdale. Oh look, they sell them at a hospital gift shop nearby.